Good morning everyone! I have a fun and colorful birthday card to share today. 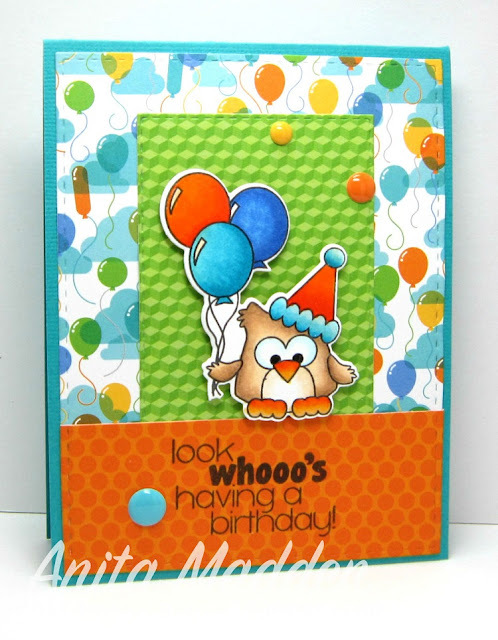 This cute owl is from Pink and Main's What A Hoot stamp set. There are several sweet owl images and fabulous sentiments in this set so be sure to stop by Pink and Main's shop to check it out! I colored the image with copics and then used the coordinating die to cut out the owl. I used the Stitched Rectangle Die from Your Next Stamp to cut the designer papers. I applied some Glossy Accents to the owl's beak and feet and used my Wink of Stella Clear Glitter Pen on the hat and balloons. Lastly, I added a few enamel dots to finish my card. Thanks so much for stopping by. I hope you have an amazing week! This is so cute!! Love the fun, bright colors and the details! !